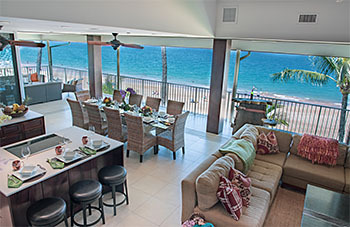 The Penthouse Maui is a spacious, four bedroom, luxury, beachfront vacation rental at Hale Pau Hana in Kihei, Hawaii. The oceanfront penthouse comfortably sleeps up to 10 guests and embodies Hawaiian Aloha like no other. Set against the backdrop of picture-postcard South Kihei. Expansive window walls slide away for a fully open air experience of sweeping ocean views, dramatic sunsets and gentle Hawaiian breezes. Contemporary luxury, exclusivity, and comfort are just some of the hallmarks that make The Penthouse Maui second to none. Every detail in the 2,824 sq ft. penthouse has been carefully chosen with the discerning guest in mind. Relaxation begins the moment you enter beneath twenty-foot vaulted ceilings accented with African Mahogany rafters. Coastal-inspired decor, posh furnishings, upscale amenities, and commanding ocean views are just a few of many features that help you instantly unwind. The Penthouse Maui offers guests plenty of privacy with three king master bedrooms, each with full en suite bathrooms. In addition, a full Jack and Jill bath connects a queen bedroom and private den with a queen sofa-sleeper. Luxury appointments in each bedroom include Apple Airplay, individual climate controls, HD flat screens, DVD players and in-room safes. High-speed wireless internet is readily available throughout the unit. Guests will enjoy the inviting and spacious main living area, equipped with a high end, whole-house sound system and entertainment center. The gourmet kitchen features stone counter tops, dual islands and stainless steel appliances. Also included are two full-size refrigerators, a wine fridge, a beer/beverage cooler, a wet-bar, and a dedicated ice maker. Everything you need for easy entertaining is already here! In the large main area floor to ceiling glass panels open to the 60-foot wide lanai with expansive and unobstructed ocean views. The large lanai includes a top-of-the-line grill for outdoor cooking with plenty of seating for lounging or entertaining. Whether grilling on the barbecue or simply watching the waves, the oceanfront lanai delivers a true, beachfront Hawaiian experience. With unobstructed Maui ocean views, it is the perfect place for downtime, ocean gazing or even whale watching in winter months. The penthouse is also stocked with all the gear and equipment you’ll need for your beach and water activities. Come celebrate family milestones or simply vacation with a group of friends. Although just steps from shopping, dining and many island activities, you’ll discover an elegant and private retreat offering the ultimate Hawaii island vacation experience. We look forward to welcoming you to The Penthouse Maui and ensuring your stay is everything you’ve dreamed of. The Penthouse is situated just three stories above the sand and surf of Kihei’s beautiful Kamaole Beach II at Hale Pau Hana. This ideal location is in the heart of Maui’s best weather with easy access to all island activities. 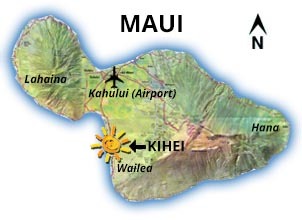 Known for its warm and sunny weather, Kihei is on the southwest shore of Maui and only 25 minutes from Maui’s main airport. Six miles of pristine beaches offer stunning views of Kahoolawe, Molokini, Lanai and West Maui. Kihei is Maui’s most popular area for swimming, surfing, snorkeling, paddle boarding, and whale watching. Restaurants, Coffee Shops, Wine & Spirits, Convenience & Grocery Stores, The Shops at Wailea, Championship Golf Courses, Wailea Tennis Club, Gym/Fitness Centers and seemingless endless beautiful beaches to choose from. The Penthouse Maui is located in Kihei, in the heart of sunny South Maui. Here you’ll find the island’s best weather and most popular beaches. Click on the “Arrival Date” box below to view availability and begin your booking. This vacation was amazing. Your place is beautiful and it only added to all of the memories we will cherish forever. From the ocean view, the beautiful lanai, access to the beach and a great gathering place for family and friend get togethers. Thanks for sharing your home with us. We can’t wait to come back. Just amazing is all we can say! What a fabulous place to enjoy with family and friends. The weather was perfect and being on the beach made for awesome memories that we will have for a life time. The staff is excellent to respond to our little issues. Thanks for everything! The penthouse is so awesome. Our group of nine had a really special Christmas stay. The staff was very nice and helpful and we had zero problems. We will be back. Fantastic! Our wedding guests love it. Best place we have ever stayed in Hawaii. Perfect set up. Thank you. Sign up to receive occasional Penthouse Maui newsletters containing updates, news and special offers. The Penthouse Maui is in Kihei, Hawaii. Sunset from a nearby beach, here in beautiful Kihei. Maui sunsets are truly one of a kind. The covered lanai is one of the unique elements that makes The Penthouse so special. Sit on the sofa and enjoy your happy hour cocktail, while watching the sunset, and listening to the waves crash on the shore.. talk about paradise. The Penthouse Maui is in Makena, Hawaii. © 2018 The Penthouse Maui.